Extend your office everywhere you go and access corporate databases, your PC, and the Internet, all with Clio. 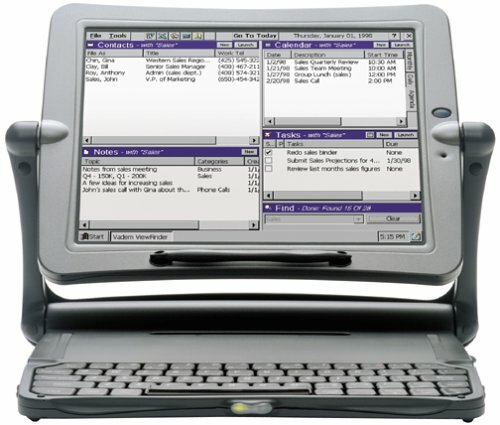 The powerful combination of innovative design and the Microsoft Windows CE operating system makes Clio the ideal PC companion for a variety of business and corporate users. Clio represents a completely new way of interacting and communicating with your PC, your network, and the Internet when you're out of the office and on the go. Because Clio includes the essentials of the most popular Microsoft desktop applications, you can work and stay productive virtually anywhere. And, thanks to Clio's flexible design and communications capabilities, you'll always want it with you to stay in touch and up to date. Why a PC Companion? A desktop PC works just fine in our primary place of business, but many of us need a mobile solution when business takes us elsewhere. Notebook PCs are often more than we need to carry and impractical for certain situations. And, while palm-size devices are very convenient for PIM updates and short bursts of communications, they aren't quite enough to perform meaningful productivity activities. Enter Clio. Its compact size with the patented rotating SwingTop design, built-in applications, light weight, and long battery life make Clio a flexible companion to your main computer when you don't need full computing power. And Clio's large display, nearly full-size keyboard, and built-in communications solutions are conducive to getting real work done--in real time, on your own terms. Clio's true power is not measured in microprocessing speed or hard drive storage capacity, but rather in the freedom and flexibility it allows the user to work, communicate, and stay productive while away from the office. Get a REAL laptop or PDA! My company got about 2 dozen of these things about two years ago.....I am guessing that they thought they looked cool or something.As a member of the IT support staff, these things are a complete nightmare.The power supplies are touchy, the memory corrupts and needs to be flashed often, and the keys on the keyboard are not very durable.In addition, Windows CE is just a plan bad OS.Top it all off with little or no service if they do break.We found some company out of California who is charging an arm and a leg per machine that we might as well invest into a real laptop. On the plus side, these do make really nice door stops. I own a Vadem Clio and I love it. With a built in modem and the Microsoft Pocket Office software it is the perfect companion to a traveler who doesn't want to lug around a laptop or can't afford one. Its very lightweight and the power cord is very small so it can easily fit inbetween items in your suitcase as well. The only downside is that like other laptops, if something integrated into the device stops working (ie. the modem) it can get very costly. I did, however, find a way around this and learned that there is a PCMCIA port on the Clio where you can just plug in a standard laptop modem or any PCMCIA device! I bought the Clio C-1000 about 3 years ago and have yet to see a product of the same form and functionality as either model.I bought it to replace a dearly loved Newton 2100, and fell in love with it from the moment I opened the box.With a battery life of 8-10 hours and a key board, you can't beat the verisility of the machine.Once I purchased my Handspring Visor, my wife took the opertunity to start using the Clio for her job, and I yet to get it back from her.I am currentlt contemplating replacing my outdated laptop with a new C-1050 model.You can't beat this machine for it features, use of use, compatibility of file formats and the "WOW! what's that!?" factor when people see you using it.The only thing that would make these units better would be the addition of Pocket PC2002 (or even Linix). I would highly recomend these for any company that has a mobile sales force.you can load powerpoint presentations onto it, email, transfere data between units (IR port), and the 8+ hour battery and sixe make it easy to use in confined areas such as on a plane.Try using a full laptop on a NYC to LA flight for the whole trip! The Clio was a good idea, but doesn't meet expectations. The passive matrix screen is difficult to read. The keyboard is small and curved making touch-typing difficult. The unit itself is a bit heavy and ackward to lug around compared to some of the latest (and smallest laptops). With a max resolution of 800x600, images and video look cheap. There are NO output ports on the unit itself - you have to hard-link to a computer even to print! No VGA-out for use with a projector. Not even a PS-2 or USB port! The handwriting recognizer works about 3/4 of the time. That is, in a page of handwritten notes, you'll have to manually correct about 1/4 of the page. It does slightly better on single words or sentences. My recommendation: Take the [amt] that you'd spend on the Clio and add to it the [amt] you'd spend on a Pocket PC and buy a decent laptop. The Clio is working great for me.I've been using it for about two weeks so far. First of all, it looks very small (and is light) when closed, but the 9.4" screen is great, wwaaaayy better than the Jornada's tiny screen. The folding arms are awesome and Tablet mode is cool too. The handwriting recognition actually works, it recognized most of my handwriting right away and I've further fine tuned it's settings since so it's even better. Recognizes cursive very well too. The C-1050 is twice as fast as the C-1000 and Mobilon Tri-Pad (by Sharp). There's virtually no delay in opening things. No booting up either, since it runs on WinCE and just suspends when you're done using it. Battery life is excellent! It isn't ten hours, but at least 6 on medium brightness & contrast. Synchronization worked without problems using the included software. It's definitely 10 times better than a Palm and in my opinion better than a laptop unless you need to be doing graphics or using Windows programs which don't come on CE as well. I highly recommend it. Originally, I was in the market for a notebook, but I ran into the HP Jornada. I figured that I didn't need a very powerful machine (for all the powerful stuff, I had my home computer); I just needed something portable that could do the basics when I had time between classes. 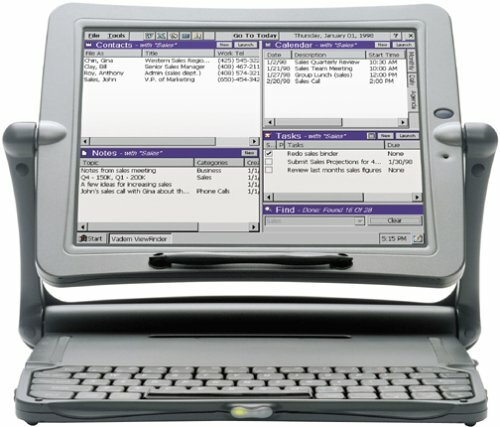 While price searching for the Jornada, I found many PC companions- Vadem's Clio being one of those. The programs, screen size, lightness, battery life, and reasonable price convinced me to buy it. I never thought it would come in so handy as it has! Not only does it have the other attributes I mentioned, but it is very reliable! It took me some time to decide what I wanted, Palm Pilot, Pocket PC, H/PC, H/PC Pro, ahh!After deciding that the Handheld PC Pro was for me, it wastime to compare the H/PC Pros and select the one which suit me the best.Iultimately chose the Clio mainly because of its fabulous form factor...theHP 820 has no touchscreen and the NEC's standard clam-shell design seems topale in comparison to the Clio's ability to be used as a tablet (for webbrowsing, writing and jotting down quick notes). When I first began tosynchronize data to and from my Clio I too experienced a little slownesswith the transfer of my contacts and calendar items, but after talking withthe suprisingly helpful folks at Clio support my data transfers are nowmuch faster (apparently the default setting is slow to eliminate possibleproblems on your first data transfer)...furthermore I had no problemsgetting connected with my ISP (Earthlink).